Chem-Dry of Tampa FL carries Chem-Dry's professional strength carpet stain remover products. Chem-Dry's line of World famous products are renowned for their stain removing power. If you're looking for a professional strength carpet stain remover in Tampa FL call Chem-Dry of Tampa and they can deliver their world famous products to your door. Chem-Dry's World Famous Spot Remover, World Famous Grease and Oil Remover, and World Famous Pet Odor Remover are professional strength and only available through your local Chem-Dry. Chem-Dry of Tampa FL has the majority of the world famous brand of products available. If you have spots and stains in your carpet and your concerned that there are no products designed to specifically for your problem Give Chem-Dry of Tampa FL a call and ask how they can help. 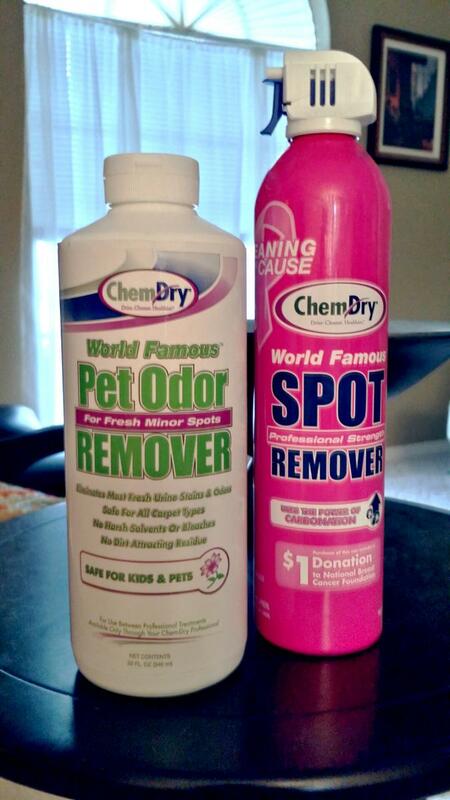 If you have spilled wine on your carpet or body lotion on your sofa Chem-Dry of Tampa has the stain remover for you. These products are used by Chem-Dry carpet cleaning technicians everyday. They are formulated to be safe but effective stain removers. Using the right carpet stain remover can make quick work of the those unsightly spots in your carpet or upholstery. The World Famous Spot remover is great for tackling those water based stains like coffee, soda, juice, and even ketchup. The World Famous Grease and Oil Remover takes on car grease, lip stick, body lotions, and cooking oil. Finally the World Famous Pet Odor Remover works great on urine of all types and other malodorous stains and spills in your home. It even works on skunk smells. So be prepare to handle all of life's spills with this trio of carpet stain removers. Chem-Dry of Tampa has you covered. For carpet stain removers in Tampa FL call Chem-Dry of Tampa.